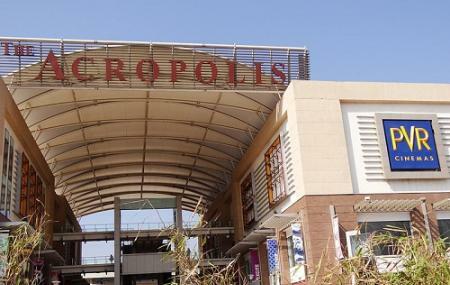 Amidst the bunch of malls scattered throughout the city, Acropolis Mall might not come off as a top notch destination among tourists. But, give it a chance and it will surprise you with its own quiet and subtle charm. This comparatively small mall lies in the Thaltej area of Ahmedabad and mostly frequented by natives and people who likes to keep it quiet. The place is home to myriad shops with items ranging from branded to local, and from all genres. The less crowd only makes it much easier to shop and indulge around. There are a PVR, a subway and a lot more small food joints sprawled in the place awaiting you to check them out and have a nice time. Ensure to come with your family here or even alone is fine. How popular is Acropolis Mall? People normally also visit Maniar's Wonderland while planning their trip to Acropolis Mall. Very good mall, neat and clean. Good place to hang out with friends and family. Good amount of restaurants too. Enjoyable place. Great mall with a lot to do. Even has a shopping center, Brand Factory by the next end. Great place for a hangout for people. Even has a banquet hall at the top floor of it, with PVR on the opposite to the side of the banquet. Also has great food stores on the ground floor. Amazing mall in there area. There are big theatre with a good space. Also available a free space for sitting and eat. There are too many shops available and huge building like a attractive. Beautiful place of that area. Nice! place with almost all shopping centers from garment to grocery. Here you can also get some good fast food. Clean mall. Movie, shopping and food available here. It's a big building. Multiple screens at multiplex. You will get branded food here. Good for younger generation. You can have photography her. You will have 2 to 3 hrs with you when you come to visit this place.